I have been feeling sorta down lately since my recent dental disaster and the fact that the sun has simply disappeared in Michigan. So when I woke up today and saw the sun trying to shine through the clouds, I decided I needed to get out of bed and do something. I’ve had my eye on several of these products for a while now so I decided to take the plunge! I have been seeing the most beautiful light pink eyeshadows on pinterest lately and I just love it! 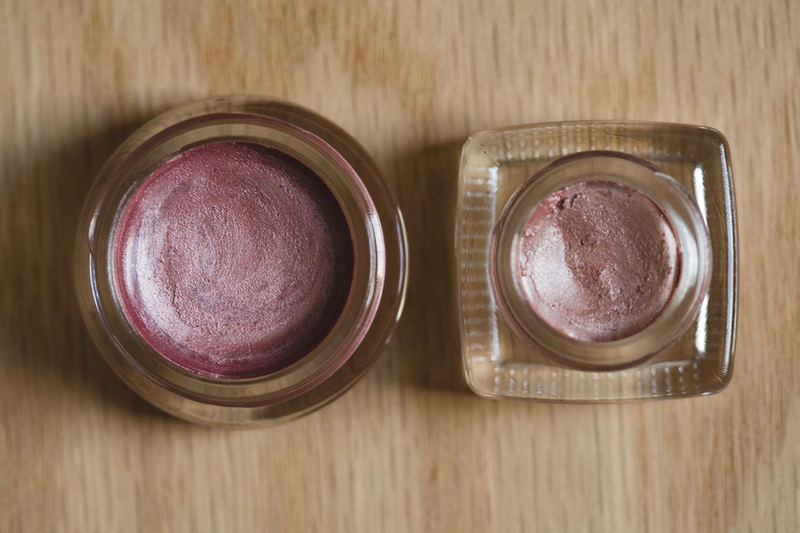 I like to use light colored or bright colored eye shadows. Dark shadows just look muddy on me since I don’t have super huge eyes. I have been doing a lot of white lately and thought a link pink would be a great change. I simply love tarte. They keep a lot of chemicals out of their makeup which I love. However, they are not perfect and there are still bad things in there but it’s a lot better than other popular brands. 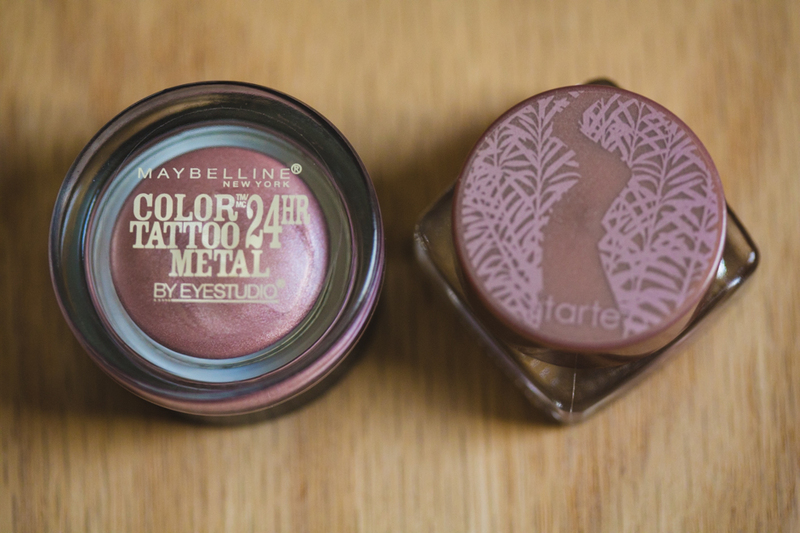 I saw a lot of great reviews on the Maybelline color tattoo shadows on youtube and the color seemed similar so I got them both to compare them. Right away, you can see how much more you get in the Maybelline one and it’s half the price. It looks a little deeper and more pink, but I’d say in the pots they look similar enough. They are also very similar in their consistency. I was VERY surprised that the Tarte one had a funky smell and the Maybelline one did not. That is actually one thing I hate about cheaper drugstore brands is the smell so this was a first. I was also really surprised how different they were on skin. The left is the Maybelline and the right is the Tarte. The Maybelline is more pink which I like. I kept these swatches on my arm all evening and the Maybelline stayed on and the Tarte did not. Now, there are probably really bad chemicals in the color tattoo one that make it stay on so well so that is something to consider. I’m torn. I am going to look at the ingredients in each and see how different they are. If it were just about color and staying power, I would pick the Maybelline Color Tattoo one all day long. It is pretty all on it’s own but I was thinking of using it as a base for the following amazing light pink shadow as well. I was also on the hunt for a regular pink eyeshadow, something that is more matte than sparkly. It’s surprisingly hard to find a more matte baby pink shade! That is how I ended up buying a palette. I had a bunch of points at Ulta that I didn’t even realize I had which pretty much paid of this palette so that turned out well. 🙂 Freeee!! Wheeee! This “Kiss the Bride” shade in the Too Faced Romantic Eye Pallette was amazing and I couldn’t find anything else like it. Luckily, I love the two lighter shades “Soulmates” and “Bouquet Toss” as well. The smaller one “I Do” is also really nice too. So although I may not use the darker shades very much, I love half of it so thats good enough for me. I have a feeling I will use this one up over the next year. 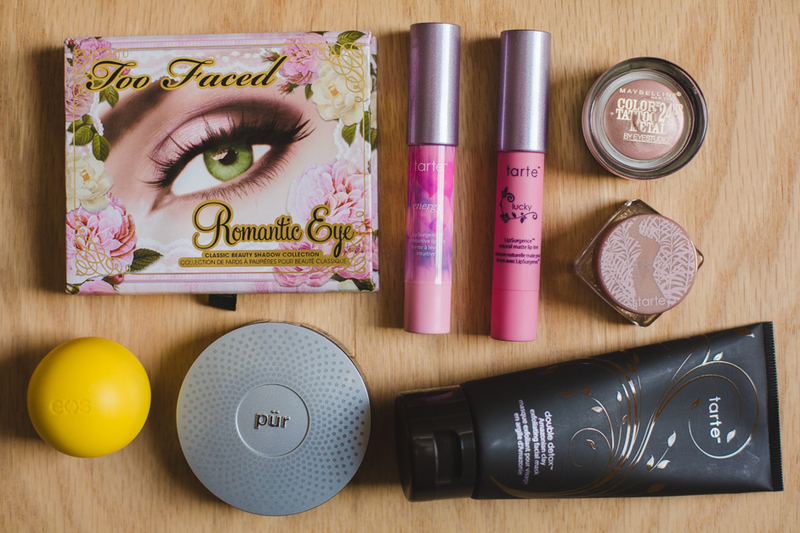 This PUR powder foundation has been a favorite of mine for a couple years now. I use it lightly over my regular foundation, kinda like a setting powder. I get it in light which is actually not even the lightest shade which is a first for me. It’s the second lightest. So there! It’s also nice to have around if I’m in a hurry and just want to throw something on my face real quick so I can face the world. I have not researched the double detox amazonian clay mask, it was a spur of the moment purchase. My face has been breaking out lately and just feels like a mess so I thought it might help. On the right side are 2 things I researched a lot and I’ve been looking forward to having them for a while now. Mostly the energy lipsurgence but I also love the lucky matte one. The Energy LipSurgence actually goes on clear but changes to a beautiful baby pink once it’s on. I guess it works with your body to create a custom shade for you, sorta like a mood ring for your lips. I absolutely love it on. It’s probably my favorite lip product of all time. It’s pretty much perfect in every way. I love to wear bright, powerful lip colors but for an every day thing, this is just what I’ve always wanted. The Lucky Matte LipSurgence is also awesome. The color is like my lips but better and I love that it’s matte. They are both really moisturizing as well and smell awesome. This, on the other hand I am disappointed with and will be returning. Everyone just LOVES these eos lip balms so I wanted to try one to see what I was missing out on. Perhaps it’s because I purchased lemon that is the issue. It smells way too much like suntan lotion. Maybe the strawberry or mint would have been a better choice. But this lemon nonsense…I am not pleased. Out of everything, the Tarte LipSurgence are my favorites which doesn’t surprise me. I’ve used these for years but just in colors that I didn’t love as much. The Energy one is my most favorite. It has been so dry this winter and my lips have been so unhappy with lipstick on. This is the best of both worlds because I get color and moisture. I LOVE THEM! I also really love my new palette. I bought it on a whim and I’m really happy that I did. It’s certainly my second favorite out of everything. I think the colors are super beautiful and not so sparkly that they cause blindness. Sparkle blindness is the worst! I don’t switch up my eye makeup very often so I don’t buy a ton of it. I kinda decide on a look for the year and go with that so I will certainly get a LOT of use out of this.